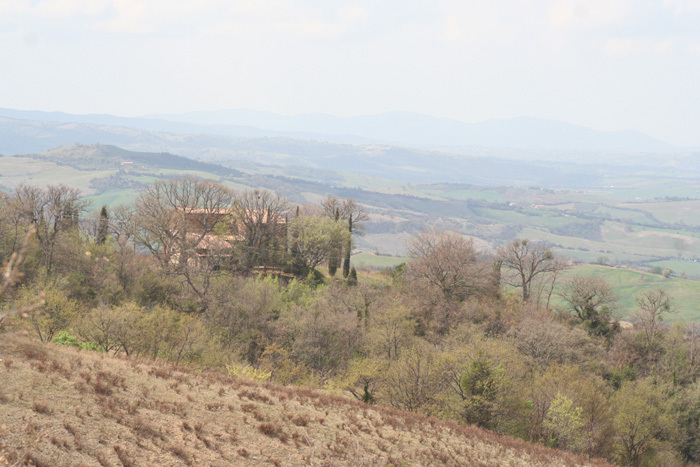 Podere Santa Pia overlooks some of the most beautiful countryside in southern Tuscany. It is also centrally located with easy accessibility to many of the famous wine vineyards, from rom Chianti and Brunello di Montalcino to Vino Nobile di Montepulciano and Montecucco. 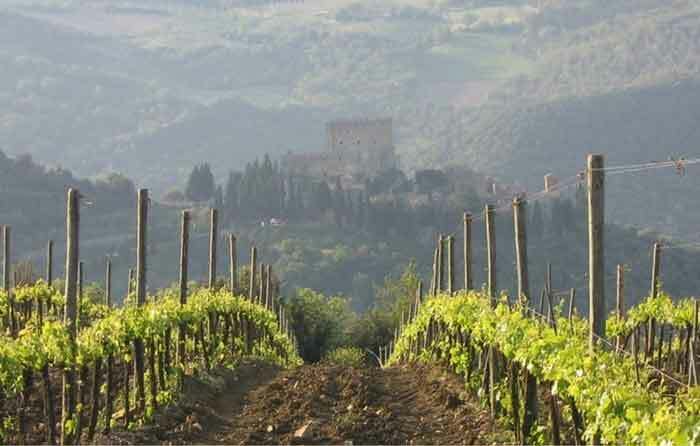 From Chianti and Brunello di Montalcino to Vino Nobile di Montepulciano and Montecucco D.O.C. Italy is one of the largest producers of wines. Its climate, soil and very old traditions make Italy a natural wine growing nation. The wines are as personal as a name, as different as the colors of the rainbow and as much a part of Italian life as almost 3,000 years of tradition can make them. The Etruscans of North-Central Italy, who created one of the peninsula's earliest civilizations, left evidence of how to make wine. The Greeks who soon after established themselves in the South gave Italy the name Enotria (the land of wine). Tuscany (Toscana) is known mainly for Chianti, while Tuscany's wine of greatest stature is Brunello di Montalcino. The fame of the excellent wines that began as Italian home-grown versions of Bordeaux has spread throughout the world of wine connoisseurs, but until recently the region itself was ignored by most visitors to Tuscany. Now though, more and more oenophiles are diverting to come to the pretty hills by the Mediterranean to discover the Maremma's secrets for themselves. The whole of Southern Tuscany is crisscrossed with wine routes. You can visit the various cellars sampling the dark, rich wine produced by the region's grapes, but furthermore the routes take you through some of the most outstanding areas of southern Tuscany. The Maremma is extremely different than Northern Tuscany. While the north boasts such spectacular cities as Florence, Siena and Lucca, the region also received hoards of tourists and can be uncomfortably crowded in high season, indeed even in low season. Wine regions in Northern Tuscany, such as Chianti Classico, have extremely well developed wine tourism and most cellars open to the general public. The Maremma, on the other hand, is far more exclusive. Few cellars open to the "general public" and the region is noticeably less touristy. This is why the Maremma, for serious wine lovers is such an attractive region to visit. Indeed DOC Montecucco borders such prestigious designation as Brunello di Montalcino, Morellino di Scansano, S. Antimo and Monteregio di Massa Marittima. Towns like Castiglione della Pescaia (with its charming fishing port and castle), Pitigliano (an amazing village completely carved out of the rocky outcrop below, an ancient Jewish village) and Massa Maritima (with its quaint cobblestoned, Medieval streets) are all fabulous little gems- they are virtually free of the crowds.Maremma is an extremely interesting sub region of Tuscany for food and wine lovers to visit. Although for centuries it was considered unfit for vineyards, in the past few decades this coastal area has become one of the most ultra exclusive wine producing regions of Italy. Therefore DOC Montecucco is one of the most promissing designation in Italy. (DOC : Denominazione di Origine Controllata – Trade name guaranteeing quality of wine. It was established in 1998 as an instrument of valorization and control which guarantees the consumer with the highest standards which characterizes Montecucco wines. The principal wine villages in the Maremma are Bolgheri, Castagneto Carducci, Scansano, Cinigiano and Suvereto. Grapes used in Maremma wines include Sangiovese, Cabernet Sauvignon, Merlot, Chardonnay, Vermentino, Cabernet Franc, Alicante and Aleatico. DOC Montecucco is located in Southern Tuscany in the Maremma region which is particularly adapted to the elaboration of fine wines. Montecucco Rosso: based on a minimum of 60% of Sangiovese it allows for a great freedom in terms of assembly with other vines. Rich and harmonious flavors characterize the Montecucco Rosso wine. Montecucco Sangiovese: as indicated by its name, this wine is largely made from the reputed Tuscan vine Sangiovese, also known as Brunello in Montalcino. The Montecucco Sangiovese should be composed of at least 85% Sangiovese and is often found “in purezza” (100%). Distinctive and imposing this wine may be savoured “young”, but it will be best appreciated after a few years and will reach its full potential after 10 to 20 years. Both these wine may also be found as Montecucco Riserva provided they have aged for two years of which at least 18 months in Oak barrels. These three types of red wine along with two white wines, the Montecucco Bianco and the Montecucco Vermentino, make up the whole of the DOC Monteccuco designation. In the Montecucco area, you'll frequently see roses planted along the edge of vineyards. 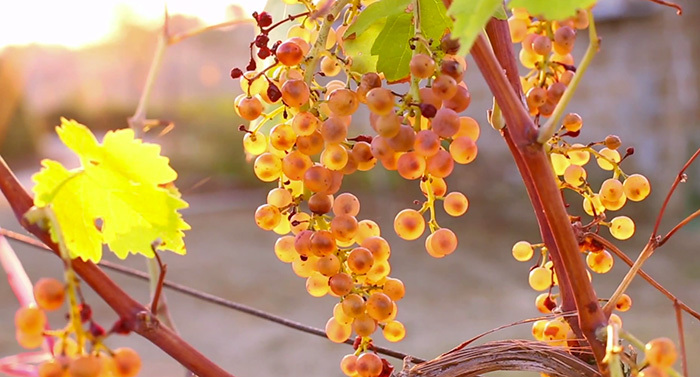 Traditionally they've served as an early warning system to protect the grapevines — the equivalent of a miner's canary. Roses also serve as a habitat for some beneficial insects that eat other undesirable insects. Roses act as early warning of mildew which is a fungal disease. The Montecucco Wine Trail runs through a vast area situated on the slopes of Mount Amiata, which has its centre at Cinigiano, lying between the Maremma region and Amiata. The vineyards are situated on the southwest hillsides of the Amiata Mountain, directly opposite the Brunello slopes; the two enjoy the same microclimate. The seven Comuni which produce the Montecucco DOC wine are all to be found in the Province of Grosseto, in South Tuscany, and are, besides Cinigiano: Civitella Paganico, Campagnatico, Castel del Piano, Arcidosso, Seggiano and Roccalbegna. The Montecucco wine trail (La Strada del Vino Montecucco) consists of a main roadway with five turn-offs. It can also be found on the official site of Strada del Vino Montecucco - Montecucco Wine Trail. This little-known area strikes the visitor as a kind of enchanted garden, with endless discoveries to be made - a different Tuscany, the real one, in which tradition and innovation are combined. It is an unspoilt landscape whose natural dignity and resources have been respected, especially in more recent wine-growing. Apart from Montecucco DOC and Maremma Toscana IGT wines, the area also produces olive oil (IGP Toscano - Seggiano is particularly worth a mention), chestnuts, which are shortly to receive IGP recognition Mount Amiata Chestnut), mushrooms, notably the ceps and ovolo species, and excellent honey. The Trail is arranged in one main itinerary and five mini-itineraries which wind through the most beautiful and interesting parts of the area from the viticultural, historic, cultural and environmental point of view. The following towns are touched upon: Paganico, Sasso d'Ombrone, Poggi del,Sasso, Montecucco, Cinigiano, Porrona, Montenero, Montegiovi, Montelaterone, Castel del Piano and Seggiano. More and more wineries believe in maintaining the delicate chain of a balanced biological ecosystem and use organic or sustainable approaches to winemaking. Proponents of organically grown wine believe that chemical farming destroys the uniqueness of the land, and the unique flavor that this 'terroir' imparts to the wine. Colle Massari, owned by sister and brother, Maria Iris Bertarelli and Claudio Tipa, comprises two estates in Tuscany: Castello ColleMassari, bought in 1999 and Grattamacco, taken over in 2002. ColleMassari was established in 1998 and is part of the Montecucco DOC in Alta Maremma, among the Docg Brunello di Montalcino DOCG and Morellino di Scansano DOC; conditions are ideal for growing sangiovese. The year 2000 saw the first vintage. Grattamacco, established in the late 1970s and part of the Bolgheri DOC, promptly caught the interest of the market for this new cradle of Cabernet Sauvignon in Italy. The first vintage was produced in 1978 from a cut of Cabernet Sauvignon with Sangiovese and Merlot. The main wines produced are ColleMassari and Rigoleto in the Montecucco DOC and Grattamacco and Bolgheri in the Bolgheri DOC; all very prestigious wines. Photo by Jimmy O'Kelly. This file is licensed under the Creative Commons Attribution-Share Alike 2.0 Generic license. "A Rose is a rose is a rose," as on Gertrude Stein postulated as part of her 1913 poem Sacred Emily, interpreted as meaning "things are what they are,". Roses act as early warning of mildew which is a fungal disease. There are two main kinds of mildews: Powdery mildew (Oidium) which develops on all green parts of the vine. We can see white powdery growth of spores on the surfaces. If this mildew sets on the grapes, the fruit will not grow properly and will eventually split and rot. This fungus likes warm and shady environment and does not need a damp condition to survive.